The children of long-time Naramata residents Bill and June June are honouring their deceased parents’ wishes with a $30,000 donation to the SOS Medical Foundation. This will enable the couple’s name to be linked with an individual patient room in Penticton Regional Hospital’s new tower. In Naramata, the June family’s orchard roots run deep. Bill and June June’s three children are honouring their deceased parents’ wishes with a $30,000 donation to the South Okanagan Similkameen Medical Foundation’s campaign to provide medical equipment for the Penticton Regional Hospital expansion. 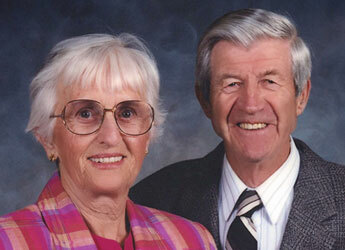 Bill and June were both born and raised in the Shuswap – June in Sicamous in 1920 and Bill in Salmon Arm in 1921. The couple married in 1944 after meeting in Salmon Arm. June’s independent spirit shone early as the small-town girl moved around Ontario while Bill attended RCAF navigator training school during World War 2. They moved to Naramata at the end of the war. A Veterans Land Act loan enabled them to purchase a neglected five-acre orchard on Naramata Road and they slowly acquired other properties eventually owning and operating 30 acres of orchard, while raising their three children Bob, Leslie and Lorraine. Fruit growing was rarely a lucrative industry so Bill supplemented the farming income with his forestry skills – falling and bucking trees. “Farming was tough in the 50’s, 60’s and heck even the 70’s. It was a tough way to make a living. Mom contributed by working in Penticton while looking after us kids and maintaining the family home, as was expected in those days”, Bob said. All three kids were required to help out in the orchard. “We all fell out of our share of trees,” Lorraine added with a chuckle. Their father was also an experienced horseman and eventually bought the family a quarter horse named Tika, who lived happily in the orchard rather than being kept in a pasture. The Junes were keen members of their community. Bill served for many years as a director of the Naramata Co-op, the BC Fruit Growers Association and eventually as president of BC Tree Fruits and Sun-Rype Products. He was also involved with an organization assisting at-risk youth and was Naramata’s Scoutmaster for many years. Both Bill and June joined the Naramata Choir when it was formed by Carol McGibney in 1962. June was very active in the church, led the Christian Girls in Training youth group for many years, and was involved in Red Cross swim lessons at Manitou Beach. She was an avid golfer and an enthusiastic participant in the Ladies Tees Up for Cancer charity golf tournament in Penticton. This donation reflects that desire. Lorraine, Leslie and Bob, would like to encourage others to consider donating to well-deserved charities such as Penticton Regional Hospital. “A donation of any size makes a difference and contributes to building a supportive community health care system,” Lorraine said. Construction of the new patient care tower at PRH is now well underway. For more information on donating to the medical equipment campaign, contact the SOS Medical Foundation at 250-492-9027 or go online to sosmedicalfoundation.com.